The outcome of the DfE consultation on the draft National Curriculum has been published (in the form of a revised National Curriculum). To consult (according to wiktionary) means "To seek the opinion or advice". So did the DfE listen? the DfE and/or National Curriculum guidance should encourage teachers to use digital technology to enhance learning across the curriculum. The PoS for subjects other than Computing still make little or no reference to digital technology. In English the guidance still refers to using the contents and index to find information. In Maths calculators should still only be used towards the end of KS2, though there is now a sentence about teachers using their judgement about when 'ICT tools' (presumably other than calculators) should be used. 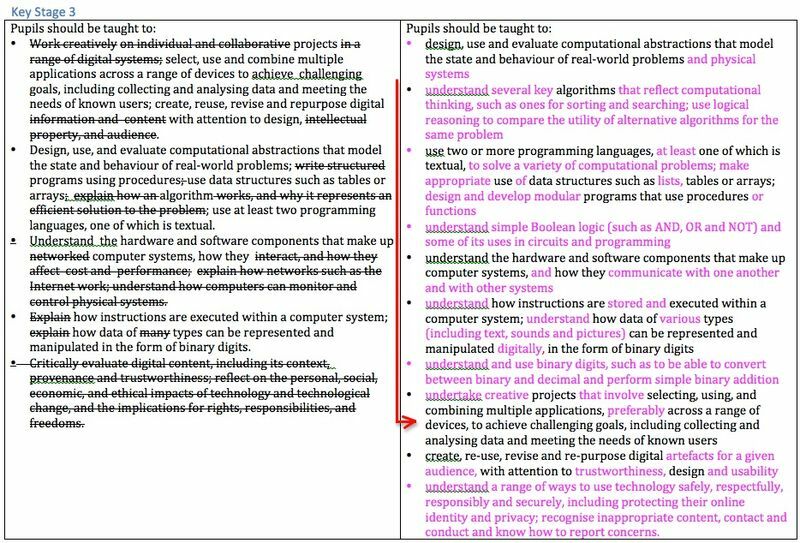 My analyses of the latest draft of the Computing NC (see below) suggest that the clear message about the need to rebalance the PoS, by strengthening the digital literacy strand, has largely been ignored. 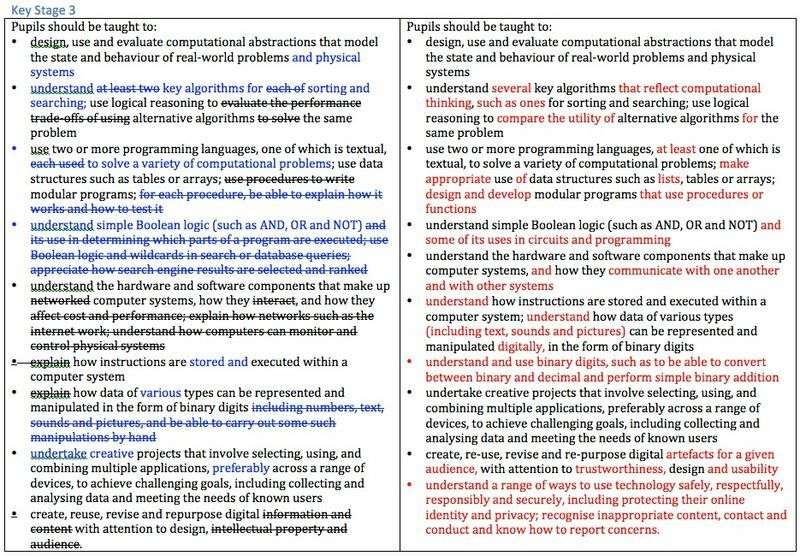 For the introductory blurb and each Key Stage I have compared the draft PoS for Computing that was put out for consultation with the latest draft of the PoS for Computing published by the DfE. These are presented below as screenshots along with some explanatory comments. In each screenshot the consultation draft of the Computing PoS is on the left and the DfE's latest Computing PoS is on the right. Text in blue on the left was NOT present in the original draft ICT PoS submitted to the DfE. Text that is crossed out (on the left) does not appear in the latest Computing PoS. Text in red on the right does not appear in the consultation draft Computing PoS (i.e. is an addition in the Computing PoS). Where the wording is slightly different in each draft, but the meaning is unchanged, I have not marked it up in any way. Notice has been taken of the concern about expecting pupils (or teachers!) to be able to describe how search engines find and store data (which is seriously hard), and a bullet on eSafety has been added. There is lots of tweaking (and perhaps making slightly more rigorous? ), but the most substantial change is the addition of a bullet on eSafety. The only substantive change is the addition of a bullet on eSafety. 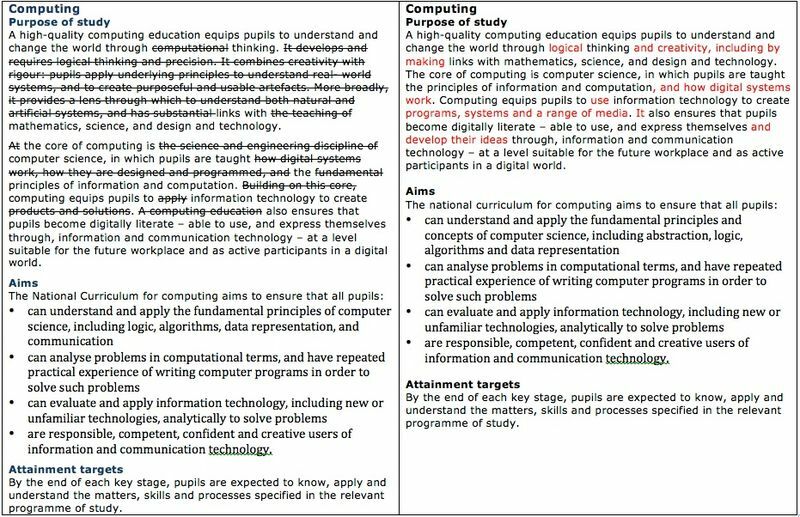 In each screenshot the BCS/RAEng draft ICT PoS is on the left and the DfE's latest Computing PoS is on the right. If you would like help with implementing the Computing PoS then you may find Computing ITT and CPD useful. This site includes "a collection of resources for use by those training teachers to deliver the new primary computing curriculum, whether for trainees' individual use, for use in lectures and workshops or for trainees to use as resources for their own lessons when working in school". This is a live and growing site and many of the resources will be directly relevant to practicing teachers (as well as those in ITT). This page was last modified on 10 July 2013, at 17:08. This page has been accessed 9,420 times.